Today has been such a beautiful day, it's the first day that has really felt like spring. We spent the day in Edinburgh, walking about, enjoying the weather with coffees in hand..all without the need for big winter coats. It was such a perfect afternoon. It's left me looking forward to the weeks ahead, when it gets even warmer and the evening get that little bit longer. Paul is planning to do some gardening this weekend, and he's going to be planting some wild flower seeds. I'm not gonna lie...I'm quite excited about them starting to grow. This morning was pretty good too. 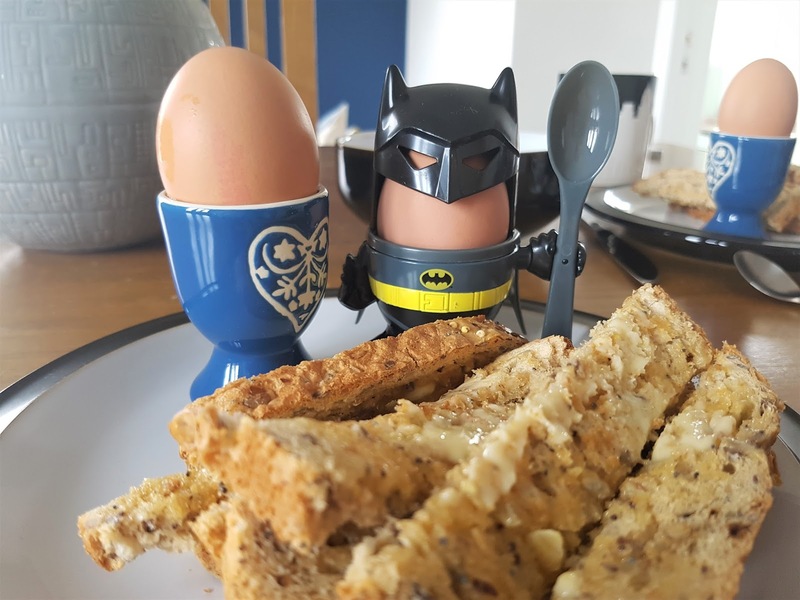 We started with dippy eggs and Paul used his Batman egg cup which makes me laugh every time. 1. Beauty and the Beast, it's as good as people have been saying and I loved it!! And on a Tuesday afternoon, pretty much had the whole cinema to ourselves. 2. A little afternoon coffee date with friends, in a very interesting little coffee shop. 3. A Fluffy Towels Yankee Candle, a gift from my mum. It's one of our favourites and smells just like clean fresh laundry. 4. Bob the succulent! Yes, we named him Bob...I'm not sure why. But he is lovely, and a very pretty little addition to our extension. 5. Picking up some treats from Hotel Chocolat for a cosy Friday night in with my favourite person. 6. Tiny puppy cuddles from my little fluff. She would be held all day if she could. 7. Lemon ricotta pancakes for brunch. 8. The Easter goodness that is currently in TKMaxx. Wreaths, snow globes, ornaments...you think of it they've got it. It'd love to cover my house in all the pastel decorations.